Background: At UFHealth Children’s Surgical Center (CSC), our standard of care has been to offer medication for anxiolysis to pediatric patients in the preoperative area. Tablet computers were received upon moving to a new facility allowing children to play interactive games. This project was undertaken to determine any differences in the use of medical anxiolysis before and after tablet computers were made available as well as any other effects on outcomes and efficiency that might result. 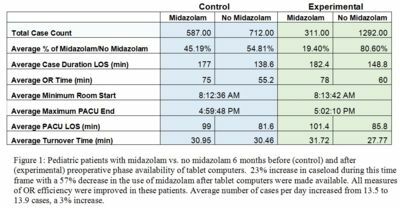 Objectives: We hypothesized that the tablet computers had decreased the use of midazolam and wished to quantify it. Decreased preoperative use of midazolam may translate into a higher level of efficiency in the ambulatory setting as there may be less time spent in turnover waiting for midazolam to be effective, decreased emergence delirium following very short procedures, and possibly less time in the recovery room due to the synergistic sedative effects when benzodiazepines are combined with narcotic pain medications. Study Design: All pediatric patients (ages 0-18 years) presenting to the CSC in the six months (control) immediately prior to the implementation of the tablet computer system (10/2015-4/2016) and the six months immediately following (experimental) their availability (5/2016-10/2016) were included in this IRB approved non-human research study. Data was collected by Business Objects, extracting data directly from EPIC and consisted of: patient age, receipt of midazolam in the preoperative phase of care, length of postanesthesia care unit stay, length of operating room stay, length of operating room turnover time, and length of surgical center operating day. Patients were grouped into those that received midazolam and those that did not. The data from the two groups were analyzed using descriptive statistic. Results: In total, 1299 cases made up the control group and 1603 comprised the experimental group. In the control group, roughly half of the patients did receive medical anxiolysis in the form of midazolam (45%). In the experimental group, only 19% of patients received midazolam preoperatively, representing a decrease of 57%. Review of control group data did show that patients that did not receive midazolam had average lengths of stay that were 38 minutes shorter than those that did receive midazolam which is comparable to the experimental group. The average postanesthesia care unit (PACU) stay was also shorter by 15-17 minutes in both groups. During the experimental group, there was also a 23% increase in caseload. All measures of OR efficiency were improved in these patients. Average number of cases per day increased by 3% from 13.5 to 13.9 cases. Conclusions: Decreasing use of preoperative midazolam has a number of downstream effects related to length of stay (LOS), safety predictors, and facility efficiency. Decreased PACU stay is especially important because PACU care is a limited resource that can cause significant delays. Decreasing midazolam use reduces the risk of synergistic sedative and respiratory depressant effects when benzodiazepines are combined with narcotics and postoperative emergence delirium in patients undergoing extremely short procedures with earlier return to normal functional levels.